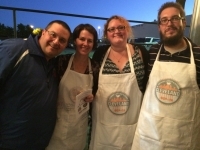 Jim Klimo of Jimmy's Jam, Carolyn Priemer of Cleveland Culinary Launch and Kitchen and Tricia McCune and Matt Bolam of Wok n Roll Food Truck at the opening celebration of the Cleveland Culinary Launch and Kitchen located at 2800 Euclid. The Cleveland Culinary Launch and Kitchen held it's Grand Opening Celebration September 26 at its facility at 2800 Euclid Avenue. Staged in the rear parking lot, over a dozen food entrepreneurs offered samples of their food products. Cleveland Culinary Launch and Kitchen is a shared commercial kitchen and food business incubator that allows entrepreneurs to create food products for sale in a commercial kitchen that is available for rent on an "as needed" basis. Managed by Carolyn Priemer, the entity currently has over 20 food entrepreneurs using its facility and has partnered with ECDI to provide business training to 10 entrepreneurs. The facility is available for rent around the clock with rates ranging from $16 to $24 per hour. For information, see their web site at www.cleculinarylaunch.com or call 216-314-7196. Bobbi Reichtell is executive director of the Campus District, Inc.